Haris Pašović is a Bosnian theatre and film director based in Sarajevo. Over the course of his wide-ranging career, he has worked as a playwright, producer, choreographer, performer, designer and documentary filmmaker. The recipient of numerous awards, he has participated in many festivals worldwide. He is the artistic director of the East West Theatre Company in Sarajevo, which he founded in 2005, and a co-founder of the Directing Department of the University of Sarajevo’s Academy of Performing Arts. He has directed some of the most acclaimed Balkan productions at key theatres across the former Yugoslavia. During the siege of Sarajevo, Pašović continued directing and producing plays, including Waiting for Godot, directed by Susan Sontag. In 1993, he organised the first Sarajevo Film Festival Beyond the End of the World and, after the war, Pašović directed a performance of Romeo and Juliet in front of the Parliament of Bosnia and Herzegovina. 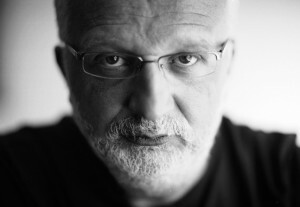 In 2012, Haris Pašović was the main initiator, author and director of a large-scale event called Sarajevo Red Line, which commemorated the siege of Sarajevo.